My Connected quilt was designed to represent the members of a family. They are closely joined to each other but they also have firm connections to people outside the immediate family. The spiky stitching around each circle shows the transient connections made every day with people in shops, on buses etc. 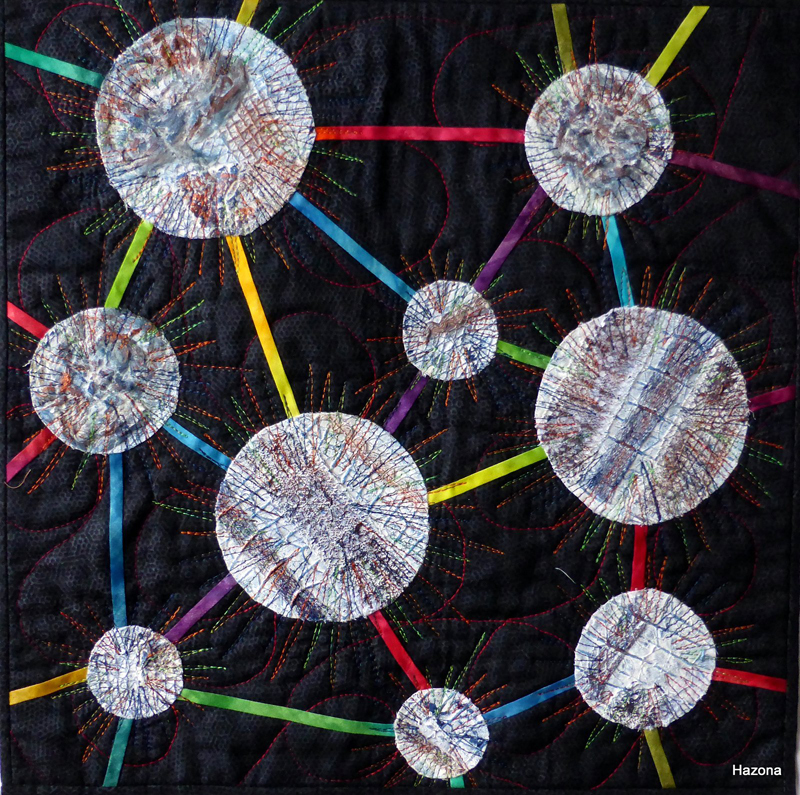 Friends who looked at the quilt all said it looks like atoms within a large molecule – an alternative explanation. I began by quilting the background pattern of swirls and loops. I then made a collage from scraps of lace, wool, string etc. These were stitched down then painted white. Blue and copper painted highlights were then added. Circles in 3 sizes were cut out and placed onto the background. The coloured lines connecting the circles are bias strips in various colours. The piece was finished by free-hand machine stitching the spiky patterns around the 9 circles. Helen, this is a tremendous abstract way to illustrate your theme, your colours are strong and bold and makes one come in for a closer look, well done.